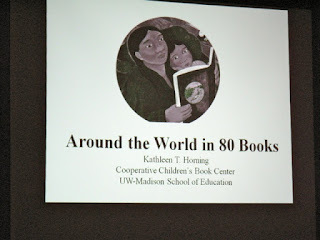 Last weekend, I was privileged to speak at the tenth annual Wisconsin International Outreach Children's and Young Adult Literature Celebration. Here's my summary of the event on twitter via hashtag #wioc, followed by some photos. 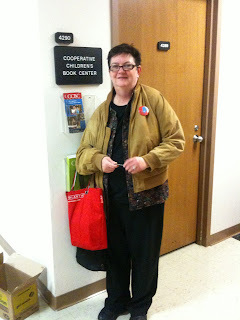 K. T. Horning raving about Francisco Stork's LAST SUMMER OF THE DEATH WARRIORS, a Don Quixote retelling. 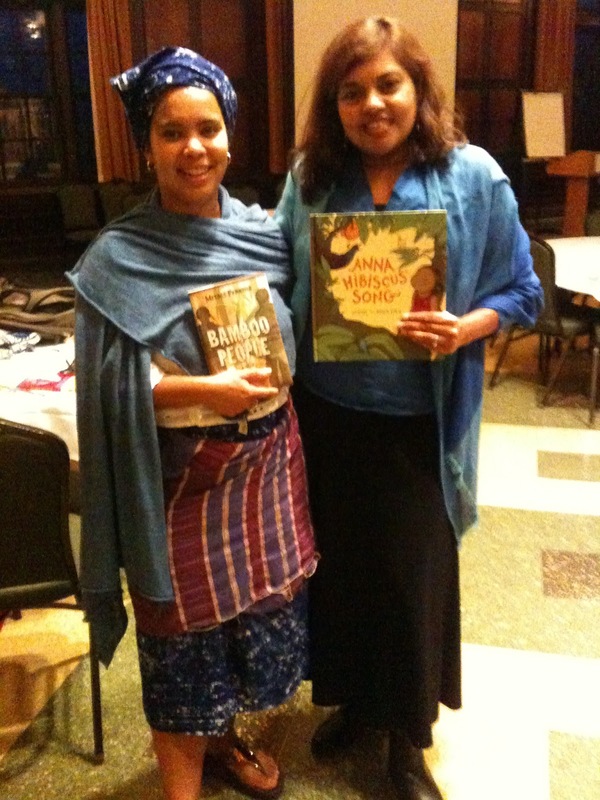 Two picture books that sound great: THE MANGROVE TREE by Susan Roth set in Eritrea and RAIN SCHOOL by James Rumford set in Chad. New multicultural fantasy for ages 11-14 set in Nigeria: AKATA WITCH by Nnedi Okorafor (Viking 2011). K.T. Horning ends with praise for WHILE YOU ARE SLEEPING by Durga Bernhard @charlesbridge, a book that travels the whole world. Now storyteller Anne Pellowski is telling us a traditional tale from Turkey. Pellowski mentions Bunko home-based libraries, apparently one of the finest social institutions in Japan. Anyone heard of it? Drawing stories, where the teller draws and tells at the same time, ending with a surprise twist, are found throughout the world. Another universal story genre is the "string story," told throughout the planet with a loop of string. Sand stories are told by aboriginal women in Australia, a "mysterious and beautiful way to tell a story." My turn to speak at #wioc11. Yikes. Here goes. 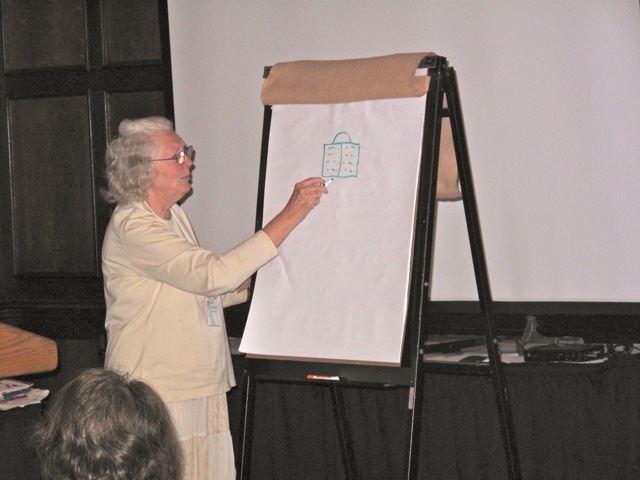 The Conference was held in the gorgeous Memorial Union building at the University of Wisconsin, Madison. My visit was hosted and coordinated by Rachel Weiss, Assistant Director of the Center for South Asia. Thanks, Rachel! K. T. Horning started the conference with an astounding presentation featuring 80 great books that span the globe. I was mesmerized. As soon as it's posted on the CCBC site, I'll share the link, I promise. Anne Pellowski spoke next, demonstrating several different genres of global storytelling, including drawing stories, string stories, and handkerchief stories. She also introduced her passion — offering IBBY-affiliated workshops around the planet that empower local storytellers to create cloth storybooks in marginalized minority languages with no picture books. Atinuke and I were the speakers during the afternoon sessions. I was entranced by Atinkuke's work and voice(s), and already posted a review of her newest series here on the Fire Escape. 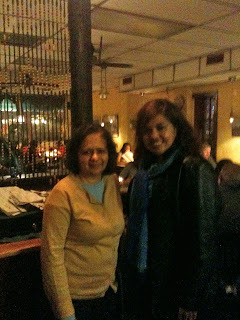 Last but certainly not least, my friend Kashmira Sheth (BOYS WITHOUT NAMES) attended the conference and graciously hosted me to a delicious Afghani meal on State Street. Madison is a stimulating University town, and Kashmira's hospitality made it feel like a home away from home.